I get why bands do EPs, at least most times. Young bands often cut one from their demos, sell it themselves at shows, or get some hot shot PR guy to promote. Some bands do it in advance of a new album or something to tide fans over until the new album. Wherein I say, cut to the chase and give us the new album. Why Sweden's Harmony did this EP, I'm not quite sure. There's only two new songs on it. So here's the breakdown. The first four songs are re-recordings from Harmony's first album Dreaming Awake: the title cut, Eternity, Without You, and She. These are done with current guest vocalist Daniel Heiman of Lost Horizon, and a terrific vocalist. I don't have this album, so I've never heard any of these songs. Suffice to say, the sound pretty darn good. They have a proper mixture of melodic and power metal, touched with some symphonic nuances, but also a truckload of great riffs and neo-classical guitar leads. Without You as sweet combination of anthem and ballad. She is quite heavy, but still a rocker. The two new songs are In His Heart and Feed my Hunger. The former takes the heavier course much like the preceding She, dropping almost all symphonic notes. It's more about riffs, and the lead is miniscule. The latter has this beguiling subtle start, but turns into this rather plodding number, again, with riffs constraining the song. Fundamentally, I wasn't all that impressed with the new tunes. If this what the future holds for a new album, we may be grossly disappointed. For my money, the first three re-recorded songs are the best here, so the net gain is three good songs. You decide if you should drop your hard earned Euros for this album. 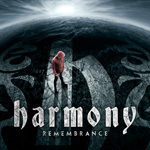 Harmony's Remembrance offers re-recordings of four songs from their first album and two new songs. The former are pretty sweet, the latter not so much.